This is a healthy way to include fiber in your diet. Make pita bread at home! This is super easy, very healthy and tastes so much better than the store-bought. You can make pita bread either in the oven or on the stovetop, and there are advantages and disadvantages to both. In the oven, pitas puff up much more grandly and make softer pockets, but they stay pale-colored and fairly mild-tasting. On the stovetop, you lose some of the impressive puffing, but gain tasty and crunchy toasted spots on the surface of the dough. So enjoy either way of your choice. Pockets of pita breads can be filled with your favourite fillings/salads and even Falafel (link). Sift in flour, salt together in a mixing bowl. Form a well in the centre; add in yeast mixture and warm water until well combined. Once combine transfer on to the lightly floured surface and knead for 4-5minutes or until the dough is smooth and elastic. Pre-heat the oven at 220deg C. Line the baking tray and set aside. After 30minutes punch down, knead lightly and divide to medium sized balls. When the pitas come out of the oven they will be hard, but they will soften as they cool. Store them in an airtight container wrapped in a kitchen towel while they’re still warm. Slice the bread into two and stuff the pockets with a fillings and salads. Posted on September 25, 2014, in Indian, Main dish. Bookmark the permalink. 29 Comments. 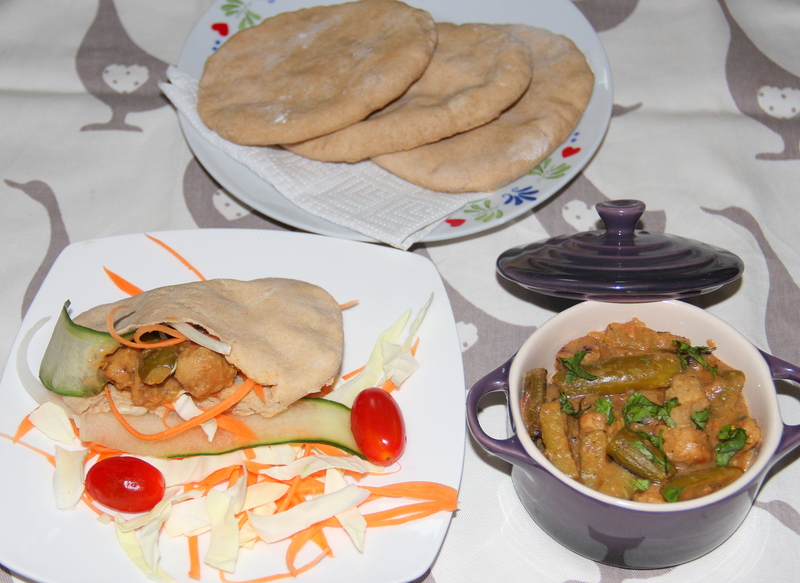 Thanks for the recipe Chitra , always wanted to try this…. Question is, can this method be used in all forms of bread-making – specifically, of course, for this recipe of yours ? Wonderful idea Chitra! I love pita bread! TC! Keep smiling 🙂 Happy cooking! Oh love homemade pita bread. Your pita looks perfect. Never tried on the stove top. Sounds like a great option.